The football visor became popular in the early 1990s for practical reasons: it helped to protect a player's eyes from becoming injured on the field. However, football visors soon became a point of fashion with players using different facemasks to individualize themselves during the game. This eventually led to rule changes at both the collegiate and professional level to address the legal use of a helmet visor. 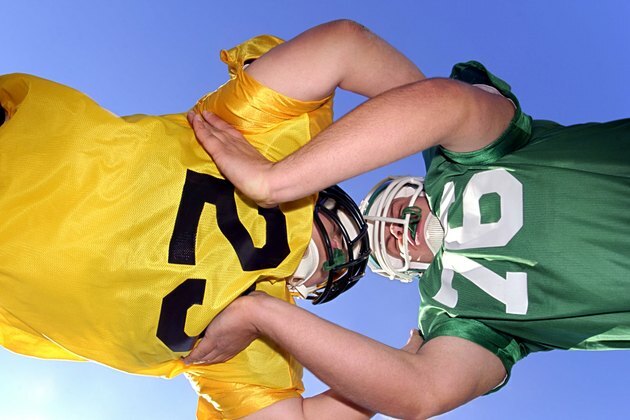 The National Federation of State High School Associations' rules for high school level football state that eyeshields or visors must be made of a clear, rigid material. Tinted visors are not allowed. There are no exceptions to this rule. If an athlete has a medical need for tinted eye protection, he must wear tinted eyeglasses or athletic goggles. The 2013 and 2014 NCAA rulebook contains two specific rules relating to helmet visors. Visors may only have the manufacturer or distributor label present. This label should be no larger than 2 and ¼ inches. The other rule states that eye shields must be clear, have no tint and are to be made from molded material. Players who are in violation of these rules will not be eligible to play unless their equipment is changed to meet these criteria. While the rulebook states that there are no exceptions, individuals with special eye conditions may get medical clearance and NCAA approval to bypass these rules. In 1998, the NFL changed their equipment regulations to included tinted visors on their banned player equipment list, primarily to promote uniformity among team uniforms and equipment. The NFL also enforces a no-play policy for equipment that does not meet the guidelines. Although collegiate players are immediately eligible to return to play after the equipment is fixed, NFL players must sit out an additional down upon fixing the equipment. NFL players may also be fined for failure to adhere to equipment regulations. Medical clearance may be obtained and a waiver applied for athletes that have a proven medical need for a specific visor type. All of these rules are explicitly stated in the NFL rulebook. There are typically three types of visors that are used: Clear visors, which are designed to prevent injury to the eyes while retaining full clarity of the field; Tinted visors, which help to reduce sunlight and protect the eyes from direct contact; and polarized visors, which filter UV rays to significantly reduce the glare of the sun. The clear shield is commonly accepted for use in the National Football League and all divisions of NCAA football as it still allows for uniformity of the uniform. Visors are mounted to the underside of the facemask and often get covered with the moisture from sweat and breathing during gameplay. High moisture content on the mask reduces visual clarity and can make it tough to see plays you need to make. Some football visors are optionally created with an anti-fog coating to combat this problem. Visors are optional and can be removed by the equipment manager during the game if it impedes your ability to see the field. What Do I Put Over a Right Arm Cast to Play Soccer?